Jack and Meg White of The White Stripes will likely be remebered well for their influence and innovation among other things. Photo courtesy of Wikipedia. Nearly four years ago, The White Stripes played their very first concert in Calgary, and it was more than worth the pain of being continually passed over during the previous seven-or-so years. From the opening one-two-three-four-five stomp of “When I Here My Name” through to the exhilarating closing passages of “Seven Nation Army,” the band held the crowd in its hand, jumping from song to song with reckless abandon as Jack White prowled the bare-bones stage in the Saddledome like a murderous bloodhound. History was even made that night when Calgary was witness to the live debut of the then-new track “You Don’t Know What Love Is (You Just Do As You’re Told).” In short, it was a magical night, and an amazing first-time arrival in our city. Of course, June 29, 2007 will also be the last and therefore only time Jack and Meg White will have visited a Calgary stage, which makes that concert all the more special in the hearts of those who were there (and even those who weren’t). The surprise announcement in February of The White Stripes’ breakup still leaves a painful sting, yet as the band made clear in their final letter to their fans, “The White Stripes belong to you now,” which means we can still keep them alive by turning to what they’ve left behind. We can go onto YouTube to view even more snippets from that night, and also browse through other highlights from their storied live career, including their many appearances on late-night television that – especially in the case of their Late Night with Conan O’Brien residencies – would often descend into blissful chaos: Jack White taking his guitar over to Conan’s desk to play a slide guitar solo during “Let’s Build a Home” is a punk rock image for the ages. Most importantly, seeing how summer is coming around the bend, we can revisit their classic albums. The Stripes never made a bad one, and while some were certainly better than others, they all have enough individual worth to drive away the competition. The ideal entry point for any newcomer (or even for fans who haven’t dipped into the catalogue for awhile) is 2001’s White Blood Cells. The album is the perfect apex in the Stripes’ career, as it shows both where they came from and where they were headed. 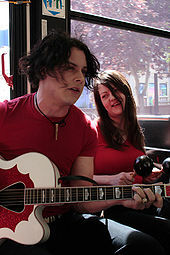 Primal, lo-fi attacks such as “I Think I Smell a Rat” and “Fell in Love With a Girl” represent the band’s past, yet showed a new found songwriting maturity, while the record also saw Jack White branching out into country (“Hotel Yorba”) and soft singer-songwriter territory (“We’re Going to Be Friends”). And then there’s “The Union Forever”, a stately yet blood-boiling epic that builds slowly and stealthily until an astonishing middle-eight that quotes an entire scene from Citizen Kane, only to crash back into a screaming finale. For many, this was the band’s high-water mark, as it represents everything both unique and endearing about their music. Yet it turned out to be a mere stepping stone for the Stripes’ two masterpieces, 2003’s Elephant and 2005’s Get Behind Me Satan. The pair can be scene as two sides of a coin: the former, with its vicious attacks on former lovers (“There’s No Home For You Here”, “Girl, You Have No Faith in Medicine”) and horny yet insecure come-ons (“Ball and Biscuit”, “Hypnotize”, “I Want to Be the Boy to Warm Your Mother’s Heart”) is a celebration of being free from a relationship and sowing wild oats; even the one song regretting that breakup, “I Just Don’t Know What to Do With Myself,” is defiant and vindictive by the end. Two years later, on Satan, Jack White seems to have realized what he had lost and how lonely, hurt, angry and lovesick he is: “Forever for Her (Is Over For Me)”, “White Moon” and “As Ugly As I Seem” are mourning of love lost, “Blue Orchid”, “Instinct Blues” and “Red Rain” lash out at his woman, and “The Nurse” even views the female race as one of bloodsucking bringers of doom. Jack gets so lonely here, he even falls in love with an apparition (“Little Ghost”), yet by the end, in a beautiful country ballad, he comes to terms and becomes at least slightly hopeful, proclaiming “I’m Lonely, But I Ain’t That Lonely Yet.” Taken together, these two records are the perfect soundtracks to summer love joyful, immature and heartbroken. As for the rest, the first, eponymous record (released in 1999) is the most punk rock the band ever was: “I Fought Piranhas,” “The Big Three Killed My Baby,” and especially “Let’s Shake Hands” are howls of blues-punk urgency not seen since fellow Michiganders the Stooges, and the sound shows their ingrained rawness that only their live shows would subsequently reveal. The band’s sophomore effort, De Stijl from 2000, is a continuation and expansion, as Jack started to develop the vocal range that would make him one of the greatest singers of modern rock. “Death Letter” and “Let’s Build a Home” brought the blues, “Apple Blossom” and “Hello Operator” brought the punk, and “You’re Pretty Good Looking (For a Girl)” was another early entry in the long list of great White Stripes song titles. Finally, the last record, 2007’s Icky Thump, was when the Stripes became stadium rock superstars: it’s their Who’s Next. The title track piled on a multitude of Led Zeppelin-worthy riffs, which also drove great pile drivers such as “You Don’t Know What Love Is,” “I’m Slowly Turning Into You” and “Catch Hell Blues.” The band continued experimenting, trying on mariachi horns for “Conquest” and Celtic instrumentation for “Prickly Thorn, But Sweetly Worn” and “St. Andrew (This Battle Is In the Air).” And in “Rag and Bone,” Jack and Meg proved their fun side had hardly dissipated after the seriousness of Get Behind Me Satan. Whether you’ve listened to these albums once or a hundred times, the music of The White Stripes is always ripe for revisiting, and the entire catalogue – a miraculous achievement of nearly flawless songwriting and artistic growth – is a treasure trove of guitar geekery, sensitive lyricism, and altogether power. The White Stripes may be no more, but their music will live on forever. It belongs to us now.